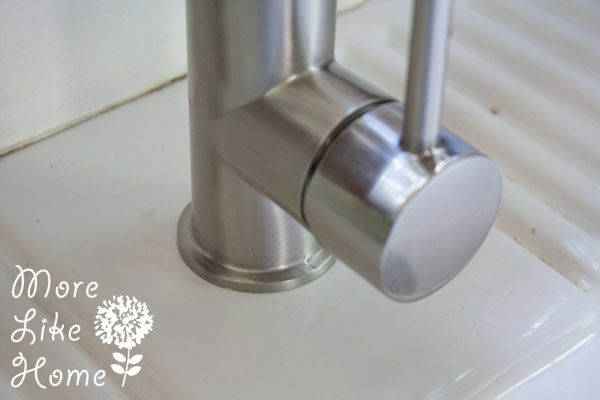 This story starts with a lesson we learned the hard way - don't buy a faucet from Ikea. At least not the cheap one. To make a long story short, the hot water started leaking non-stop and the only way to stop it was to turn off the water below the sink. We lived with it for a few weeks. But let's face it, I have a limited amount of sanity per day and I can't spend it crawling under the sink to get to the hot water. So we swapped our faucet for this guy. 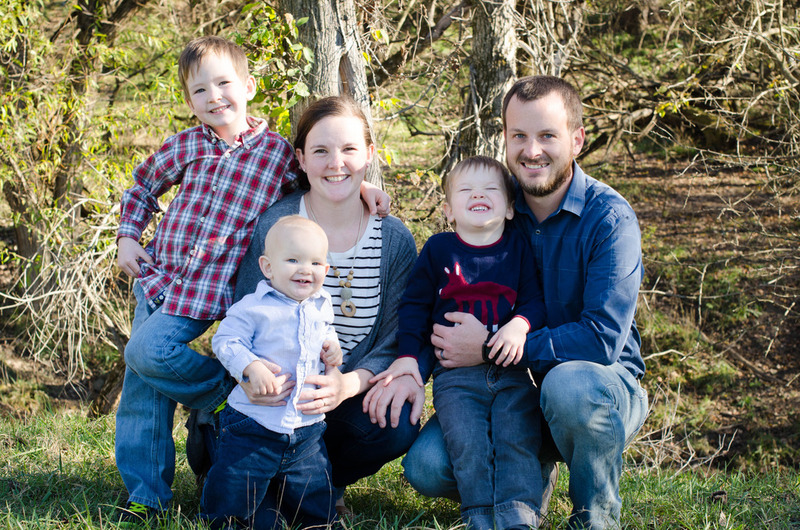 One thing we learned through our faucet hunt was that they can be a little pricey. Even at Ikea most of the faucets are $150-250. So when Husband's search turned up this $105 version on Amazon with great reviews, we decided to give it a try. It had the single-hole design we needed and we loved the modern style. Plus after living without a sprayer we were glad to add one into the mix. Once it arrived Husband had our new faucet up and running in just a couple hours. If you're looking to get your feet wet (ha?) 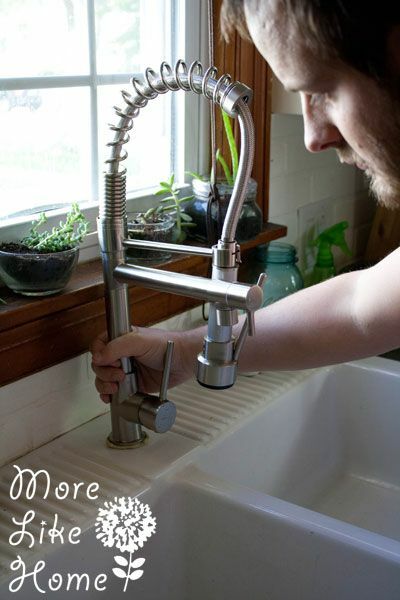 with DIY home improvement a new faucet could be a great place to start! So here's the simple guide to how we did it. The first step is always turning off the water. 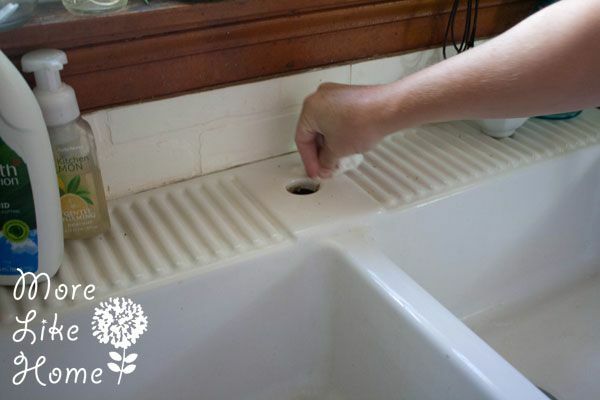 We have valves in the cabinet under the sink to turn off both the hot and cold, but if you have an older home you may need to head to the basement. 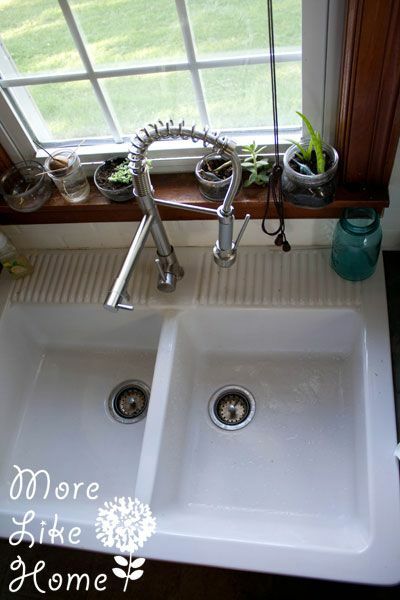 After you turn off the water, turn the faucet back on to make sure no water comes out. Nothing? Good. Let's continue. 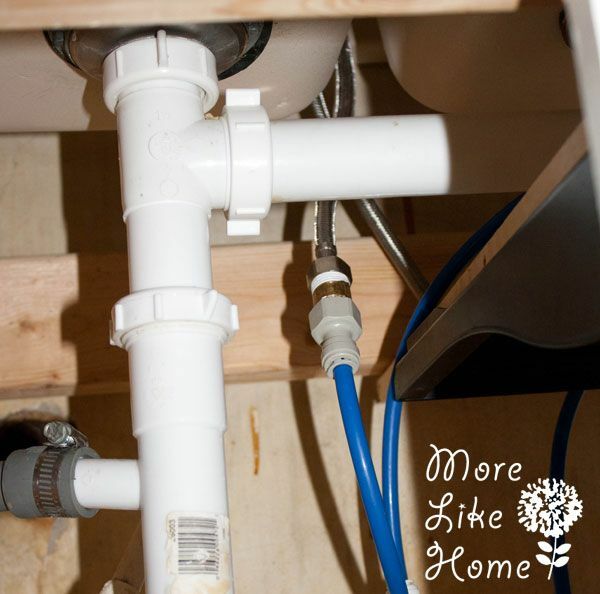 Now crawl back under the sink and disconnect the hot and cold water lines. It will probably be something similar to the pic below. Use a wrench to separate that joint between the silver and blue pipes (yous probably won't be be blue). Once everything is unhooked we were able to just lift the faucet off the sink and pull the silver pipes up through the faucet hole (super technical terminology. you're welcome.). 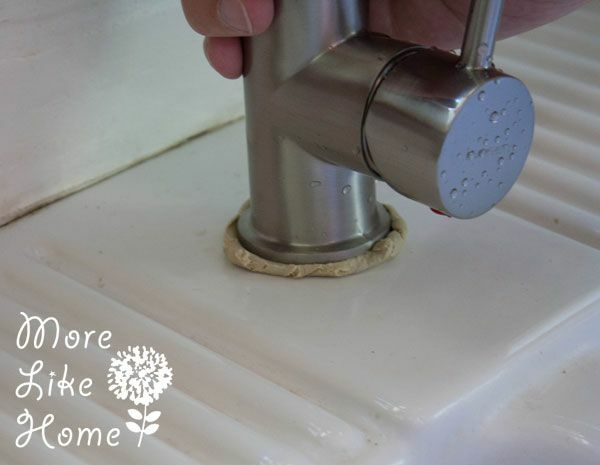 We scrubbed around the hole with paper towels to make sure there was no old residue before putting in the new faucet. But before you attach those you need to slide them through this bigger copper-ish piece. Then attach them to the faucet. We attached them to the faucet first, then found out the other ends are too big to fit through this piece so we had to take it back apart and start over. Which took like two minutes, but still. Consider yourself warned. Anywho, once the silver pieces are screwed into place you can go ahead and screw Mr. Copperish to the base of the faucet as well. 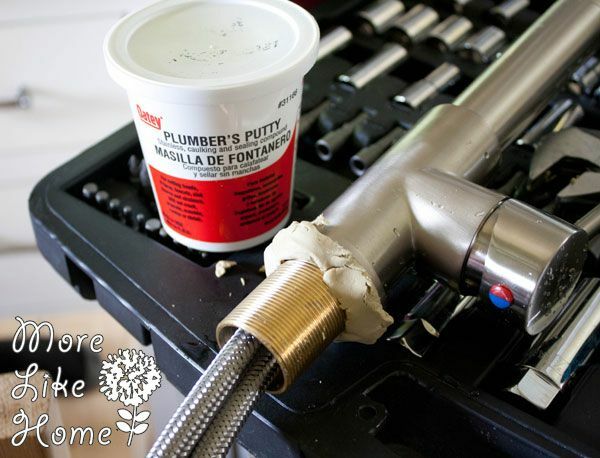 Now you'll want to grab some plumber's putty and apply it all around the base of the faucet. Be generous here. It's better to wipe of extra later than to have a leaky seal. 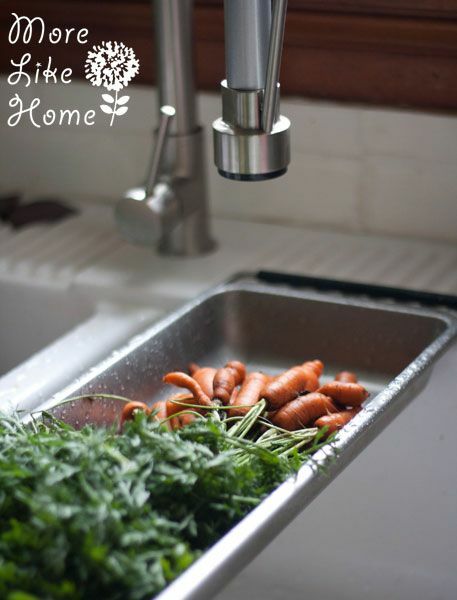 Slide the silver pipes down through the sink hole and set your faucet into place. 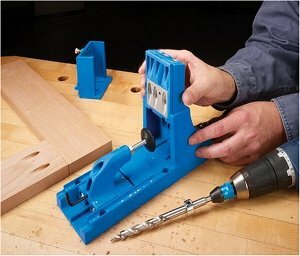 Go ahead and squish it down a little to start making the seal. Now it's helpful to have a second set of hands. Person #1 can hold the faucet in place, and more importantly keep it straight (make sure the handles are facing the right direction and such). Person #2 gets to be the spelunker. 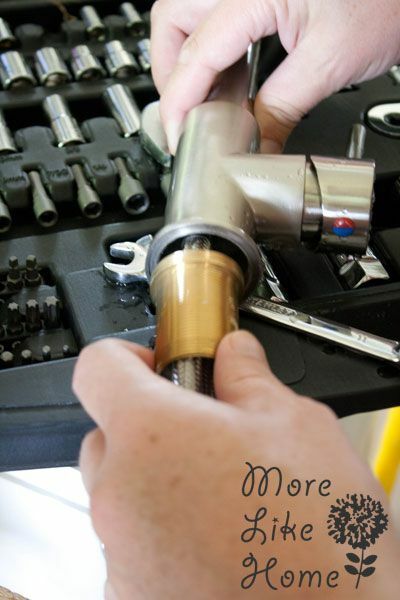 Grab the rubber washer and the nut that fits the piece on the bottom of the faucet. 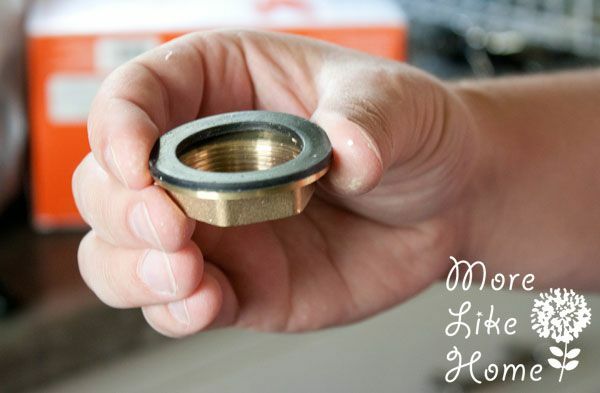 Set the washer on top of the nut (pic below), crawl under the sink, and use a wrench to attach the nut to the base of the faucet. 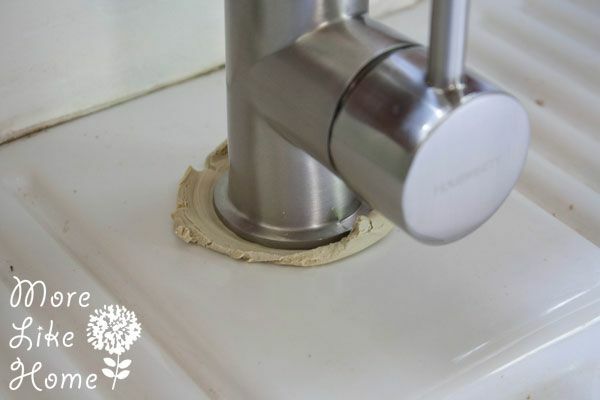 Be careful when you are tightening the nut - you definitely want it tight enough that the faucet won't move or leak, but I've read stories of people going Superman on it and tightening it so tight they crack their sink. So maybe just go Batman on it, mkay? 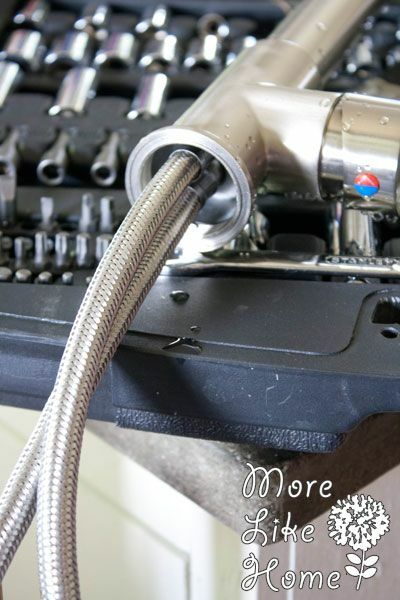 Then use a wrench to reattach the water lines (make sure you connect hot-hot and cold-cold!). 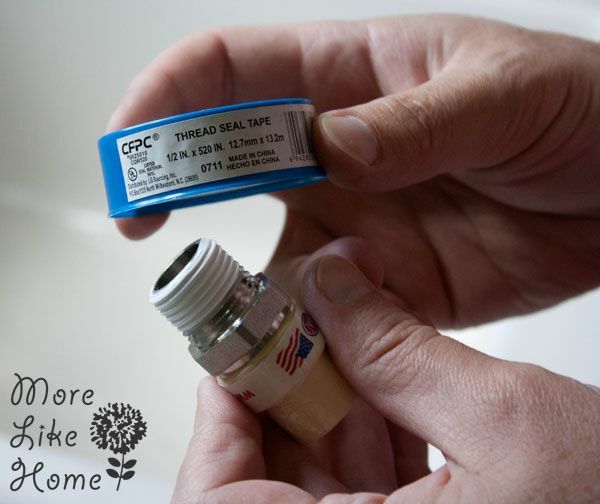 Turn the water back on under the sink (or in the basement) and give the faucet a quick test. Double check to make sure the hot is hot and the cold is cold. Good? Good. Now you just have to clean up the extra putty around the faucet. Enjoy your new faucet! Do a celebratory load of dishes! Or give the baby a sink bath! 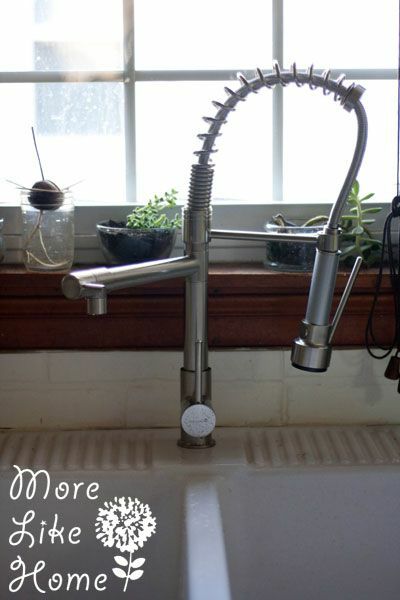 We've only had our faucet a few weeks, but so far we are really happy with the change. And loving that sprayer. Also loving that my sink was actually empty enough for a picture. 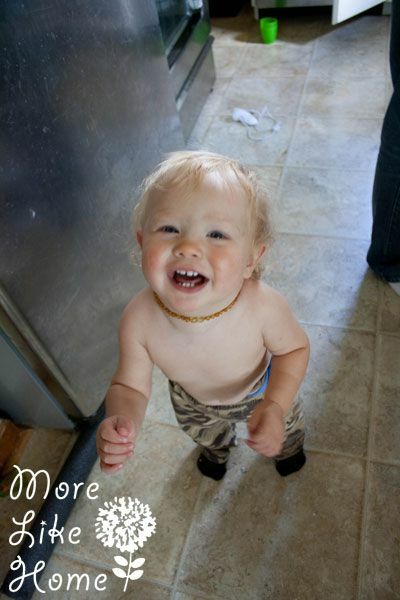 WHERE DID ALL MY DISHES GO? Installing a faucet is one of those projects (like most things involving water) that seemed really daunting to me at first. But it really isn't that bad! 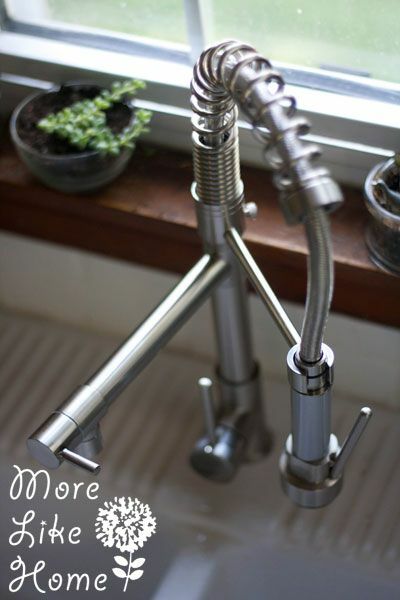 Of course things could be just a little different depending on the style of faucet and sink you have, but if you understand the steps it's pretty straightforward and totally doable! And I'll leave you with this tip - it always pays to have a good helper. Or three. 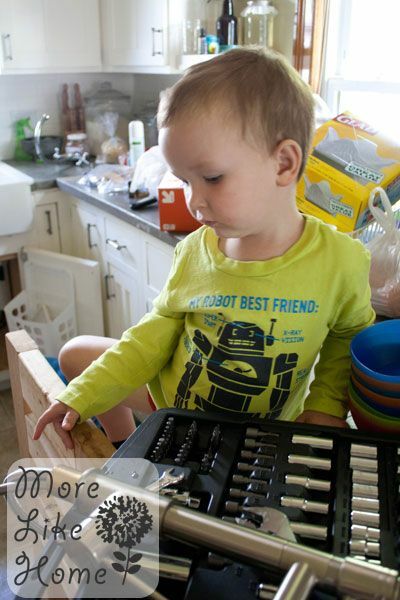 Of course one helper to hold the faucet, but maybe another to take all the bits out of the tool kit? And one to empty the cupboards. Just for good measure. But don't worry. 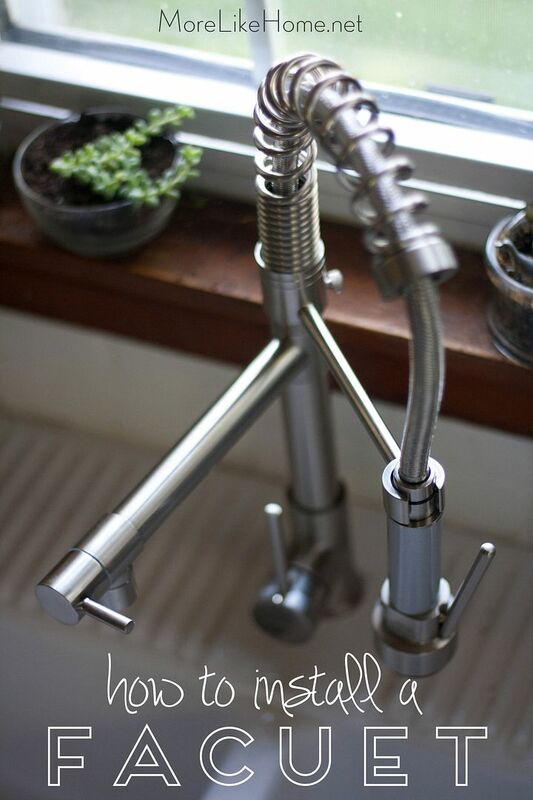 You'll be so smitten with your new faucet that you won't even notice. 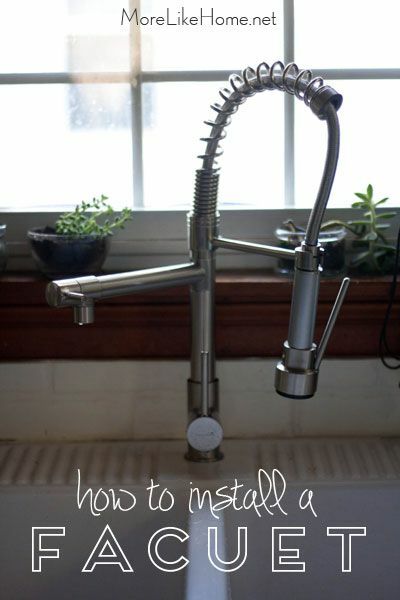 Have you ever installed your own faucet? And feel free to share a picture! I love seeing what you guys are up to!